Is it the end of the line for Santa Fe Building sign? The white-lettered "Santa Fe" sign atop the landmark Santa Fe Building could vanish--refaced with signage touting the building&apos;s newest tenant, Motorola, under a permit request being weighed later this week by city officials. Under a permit requested by Motorola Solutions Inc., sign designer Icon Identity Solution and property manager Jones Lang Lasalle, the decades-old rooftop sign at 224 S. Michigan would be shrouded in a new lighted Motorola sign. The request is expected to heard Thursday by the Commission on Chicago Landmarks&apos; permit review committee, according to the body&apos;s draft agenda. Currently, the building&apos;s major tenants include the Chicago Architecture Foundation and architecture firms SOM, VOA Associates and Goettsch Partners. The Santa Fe sign is not original to the building, but falls under the purview of landmarks officials because the Santa Fe sits in the city&apos;s Historic Michigan Boulevard Landmark District. The city&apos;s landmarks staff recommends approval of the permit because the new sign "will not have an adverse affect on the significant historical and architectural features of the landmark district." Staffers also said the sign must match the color and illumination of the Santa Fe sign. 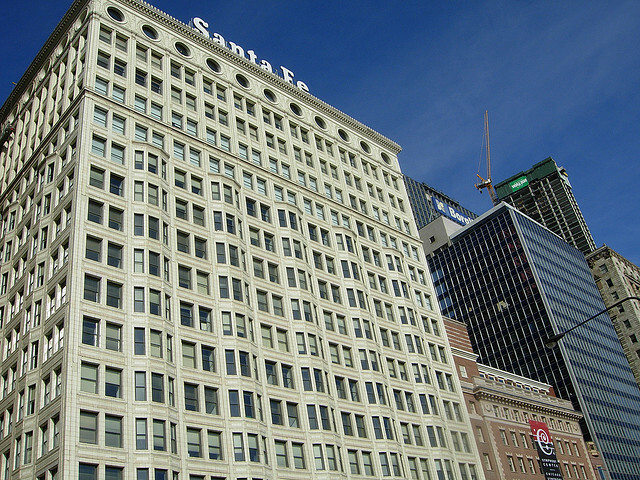 Originally the Railway Exchange Building, the structure once contained offices for numerous railroad companies, including Santa Fe Railroad. Santa Fe later purchased the building and erected the rooftop sign. The building is now owned by the University of Notre Dame.